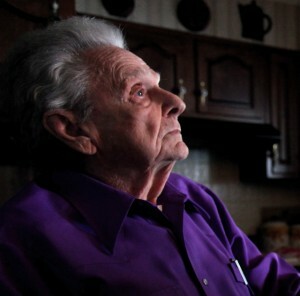 Legendary bluegrass musician, Dr. Ralph Stanley, makes his acting debut in MY FOOL HEART, playing Jim Waive’s grandfather. As a seasoned performer for over 60 years, Dr. Stanley is no newcomer to performance. In fact, it was while watching Dr. Stanley hold an enthralled sold-out crowd at Charlottesville’s Paramount Theatre that director Jeffrey Martin first thought of Dr. Stanley for a part in the film. “Listening to him talk during the concert, I could imagine him as the grandfather. Later it was surreal and humbling to hear him say the lines that I’d written for him.” The scene was filmed in Dr. Stanley’s own kitchen at home in the coal country of Southwest Virginia. With a crew of two, Martin was able to use minimal lighting and a Canon 5D Mark ii camera with a Nikon lens to film very close to Dr. Stanley and Jim Waive as they performed the scene. Dr. Stanley was a gracious host to the actor and crew. Best of all was seeing that the highway outside was named Dr. Ralph Stanley Highway. Dr. Stanley reminisced a little about his musical past and shared a few stories. This photo was from that kitchen scene.